Researchers in the United Kingdom have been rewarded with a rare photograph of one of the country's shyest mammals, the wildcat, which obligingly took the picture itself. The animal was caught on a special camera at a nature reserve at Abernethy in Perthshire, owned by the Royal Society for the Protection of Birds (RSPB). As part of a study to find out more about the species' range and numbers, the RSPB set up cameras with infra-red beams across the site. Ron Summers, research biologist for RSPB Scotland, said: "Because the wildcats are rare, very wary of man, and nocturnal, they can be difficult to see, far less photograph." "It is reported that they became extinct at Abernethy at the end of the 19th Century, and probably returned to the area in the mid-20th Century." Maimie Thompson, public affairs officer for RSPB Scotland, told BBC News Online: "The cameras were there not just for the wildcats, but to record other mammals in the forest." "We were pretty certain there were wildcats in there, and this has confirmed it. "They always used to be part of the forest's life, and there ought to be room for everything in there. It is about 8,000 hectares." Naturalists estimate that there are only between 3,000 and 4,000 wildcats surviving today. During the 19th Century, they underwent a drastic reduction in range, from being widespread throughout the UK to surviving only in north-west Scotland. The RSPB says the animals' expansion during the middle of the last century coincided largely with a decline in the numbers of gamekeepers. 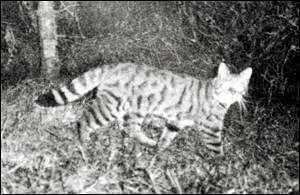 Wildcats usually hunt at dusk and dawn, and sometimes during the night as well. They thrive on a mixed diet, in which small mammals predominate. They are much bigger than domestic cats, and most easily distinguished by a characteristic club tail which is ringed in black.